By this time, I’m pretty sure everybody (well, everybody on Pinterest at least) have seen the 4th of July layered drink recipes floating around the interweb. They’re fun, they’re easy, and the little guys and gals, think you’re a bad-a**, magic wielding Mama when you whip em out at your backyard barbecue. This year, we thought Halloween might want in on a little bit of the action. The drinks couldn’t be any simpler to make and the whole thing revolves around the simplest of scientific terms: density. The more sugar in a liquid, the ‘denser’ it is. By halving the sugar content of layers two and three, we created pretty little (educational) layers. The sons know by now, even if it’s fun, if there’s an opening for any kind of teachable moment, I’m all over it. 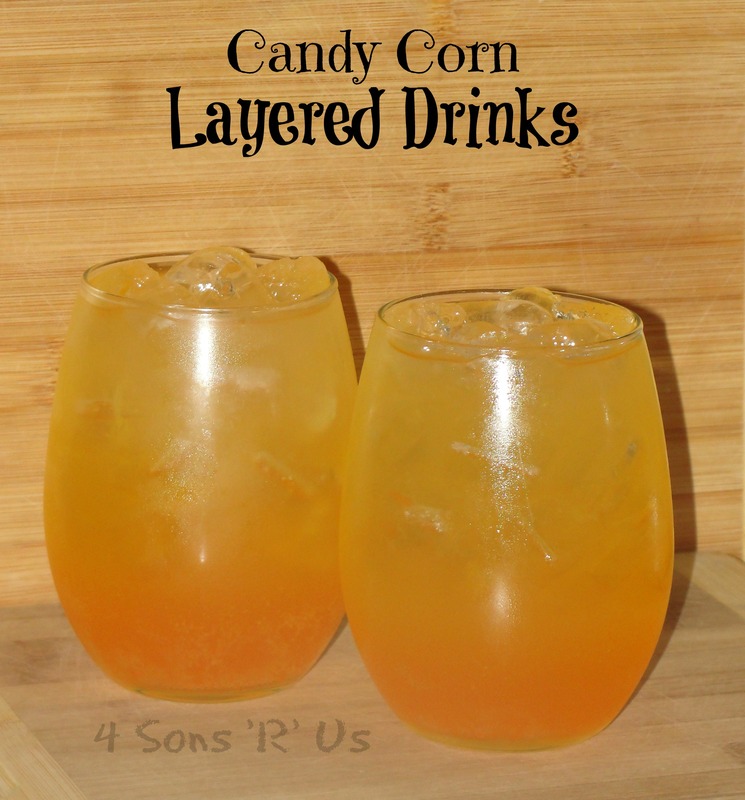 Candy corn is a Halloween staple, and though some people love it or hate it, I think everyone can and will enjoy these layered candy corn drinks. The sons got a tickle out of them, especially the younger two. It was also pretty neat to watch the discover each different flavor. Festive and fun? That’s my kind of party. Aaaand, speaking of parties, layered drinks can be so fun for parties, and there’s no doubt in my mind that these would be perfect for any Halloween party! Serving a crowd? Don’t have time to make multiple individual servings? Follow the same recipe, but make it in a punch jar instead of a glass. The layers are easily seen up close and personal, but if you really want them to stand out, especially the white top layer, use less yellow and more white. 1. Fill your cup/pitcher/whatever you are using up to the very top with ice. 2. Pour the orange soda in first until you’ve filled about 1/3 of your glass. 3. Next, slowly pour the Gatorade directly on top of the ice and let it trickle down on top of the orange soda until it fills 2/3 of your glass*. 4. Finally, slowly pour the lemonade on top of the ice and let it trickle down on top of the Gatorade. *Do not stir the liquids or this won’t work. These are really cool, and sound really tasty too! Thanks for being at FF! I hope you’ll have a great Halloween we! Adorable way to celebrate Halloween!